All new Serato Video - for ITCH too! Video is a weird scene. For some reason, it's a technology that has been awkwardly adopted by DJs using techniques better suited to audio. But that didn't stop Serato from taking a detour from their DVS route to make Video-SL that controlled video with vinyl. But when ITCH came along, controller users wanted a slice of the moving picture action, but alas it was not to be. Until now that is. One of the rumoured ITCH v2 updates has been realised, and at the same time has been rationalised to one plugin. Serato Video is here. Serato are proud to announce Serato Video, a brand new plug in for Scratch Live and ITCH that allows DJs to playback, scratch and mix video files using turntables, CDJs or supported controllers. Based upon Video-SL, the popular plug-in for vinyl emulation software Scratch Live, Serato Video will offer support for both Scratch Live and ITCH, giving DJs more flexibility than ever. Serato Video’s versatility gives DJs the ability to play music videos at a club or to perform unique visual show on a large scale. Add video clips to your Scratch Live or ITCH performance. Serato Video will be a free upgrade for existing Video-SL customers. 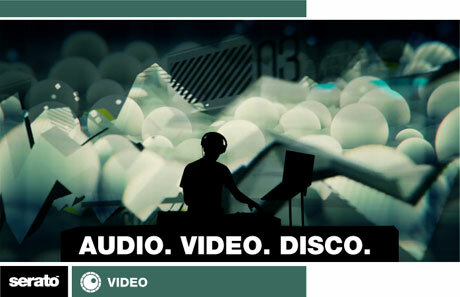 Serato Video will be available for purchase online and in store for US$149 in March 2012. This plugin will work in ITCH and SSL - no separate versions needed. If you own ITCH and SSL, you need only buy it once. If you already own SSL, you'll get a free upgrade. If you buy Video-SL at the current $99 discounted rate, you get a free upgrade too. That offer ends in 2 days. This works with SSL and ITCH, but not DJ Intro. I do have beta versions of SSL and ITCH that work with Serato Video, but being on my way to NAMM, and Premier Inns not have ITCH controllers on the room service menus, I've been unable to check it out yet. This is a big deal. Now all professional Serato users can get video for not a lot of cash. Granted, Virtual DJ users have ben able to do this for years (like many other things that other DVSs haven't been able to do), but now there's only less reason to look away from the Serato brand, especially for controller users. And given that NI were recruiting video specialists, it's only a matter of time before everyone will be dabbling in moving images. How that translates to the club remains to be seen. So ITCH users - happy now? Are you going to start to do wonderful things with video, or as I suspect think you needed it when really you just craved new stuff? I'm sure Thursday will bring us a lot more useful info, to show us if video is the next big thing for DJs. Versions are being tweaked right up to show time, so you'll just have to wait a few days to see it in action. I'm an Itch user but had to buy a SL2 box so I could do video with my NS6 at my video gigs. Yeah I'm very happy about this news! let us hope that they will fix the stability issues with video. because who needs videos if serato is not stable?? there are many reports on the forum from users who have not updated since serato 1.92 because any version ofter that causes crashes with video. next: if they do not fix this then itch users will complain about crashes. anyway. audio is the most important in the club. who cares about video anyway. all the real big artists use audio only and no video. SSL 2.3.3 fixed the corrupt mp4 problem that was causing crashes. I had to fix all my corrupt mp4s but now SSL is crash free so far and i play out 3-4 times a week. The club/bar owners that pay me extra to do video really care about me doing video. I don't under how this is new... Serato VSL had Midi control in Scratch Live for 3rd party controllers years ago. This is just a new name for for Serato VSL..... Come on people think! All that is new is video for ITCH. What I want to know is if MixEmergency will work with that new Scratch Live beta? Can any one tell me that? "Utilize 3rd party controllers with Serato Video’s MIDI control in Scratch Live." I guess external MIDI control still isn't coming to ITCH.......argh! WTF!!!!! I am very happy about this news. Admittedly it's taken a while but it means I can now play videos with just a controller and a laptop, good news for my back! Very Great News... I will switch to Itch from NI Traktor. I'm please with the news it could breathe some life back into my vci-300... Happy days! Sorry just to check - i might of taken this out of context. •If you already own SSL, you'll get a free upgrade. They wouldn't do video for Itch though it's not really different from Scratch anymore, then they said they'd do it last year, now it's finally here. Lack of MIDI control in Itch means that unless one of the controller companies is making a video controller already (doubt it), you're better off staying with Scratch unless you like using a mouse/trackpad. No new features for OG Video SL users. Why not at least turn on the 3rd or 4th deck Itch and Scratch already have for video? Then all the VJs who switched to Serato for video could really get some things going. Most VJ software has let you mix 4, even 10, channels of video for years. ^ he's right... i'm not about to invest in "Serato Video" if it means i'll have to use silly keyboard commands to work the features in Itch. the SP-6 commands were ridiculous, i felt like i was gonna get arthritis..
..i wish Serato would give up the ghost and allow 3rd party midi, even if they only allowed a tiny segment of assignable commands. i'm pretty certain he meant "VSL" ...but Gizmo is probably all busy getting ready for NAMM and hasn't noticed yet. I have to say mix emergency is so much better. I was just playing with the beta of Serato Video and I still can't do half of the thing I can do with Mix Emergency. I have to agree with you CueCut! @prevolt and @sinjintek: Serato has confirmed that MIDI support is forthcoming in Itch. I bet the beta version Gizmo has supports it in fact. The limits on effects for ITCH have pushed people to Traktor. WHERE IS MIDI OUT, BEAT JUMP AND SPLICE FOR SCRATCH LIVE?????????? I hope the 10 Cue button on the new RANE mixer are rubber. There was a lot of errors in that vector image. I only had a blurry photo to work off of.